BACK IN STOCK! NOW COMES IN 60ML! SUPPLY IS VERY LIMITED. 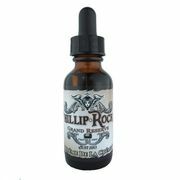 The Phillip Rocke Grand Reserve is an ultra premium, top shelf brand of e-liquids created by renown artisan juice mixologist Phillip Rocke (maker of ANML Lopper, Carnage and Gemini Vapors). It features e-liquids that offer an unparalleled and refined vaping experience through its top quality ingredients and the specialized way it is produced. The first flavor to be created for this line is the Crème de la Crème – hazelnut cream with a hint of coffee. Made with the extract of real Arabica coffee beans and all natural flavorings, it is aged & steeped in reclaimed brandy barrels for 2 1/2 months before bottling. This premium e-liquid is highly regarded for reasons. Exceptionally smooth, complex coffee – créme palette with whisky undertones. Exquisite. Its insane how good this juice is, its so smooth and has just the right amount of hazelnut flavor. I hope its still in stock the next time i make an order! It’s a shame that two other reviewer’s let the cat out of the bag on this one already. I would have totally said avoid this juice at all costs…SO THAT I COULD BUY IT ALL MYSELF! And yes as you know from me…taste is subjective, so keep that in mind. OK, so any time anyone attempts to persuade you to spend $35 buck on a bottle of ‘this amazing e-juice’, your first reaction is for your eyes to pop out of your head and look at the person like their possessed. $35 bucks! What juice could possibly be worth $35 bucks???? Ummmm….this one?! Upon opening the bottle and um…smelling the bouquet, I was stunned at how delicious it smelled! Sometimes an e-juice smelled au natural isn’t the most attractive thing. The flavors jumped forth out of that bottle and smacked me in the face. Rich (but not bitter) coffee, and oh man the hazlenuts. I swear I even smelled the creaminess of the cream! If the taste ended up being even remotely close to the smell, I was in for a treat. I watched as this golden brown elixir oozed down into my Silo Beast and no exaggeration I began salivating. Top on, open’er wide up, set phasers for stun…..BAM!!!!!! There’s only one other e-juice that hit my palate with a smack so hard it knocked me out the door and into the stratosphere and that was Bowden’s Mate by Five Pawns. It was an all and all out assault on every taste bud in my mouth! Rich, smooth, but not harsh coffee, the almost perfect mix of hazelnut flavor and the perfect amount of sweet creaminess just wrapped around my tongue, tonsils and yes even nose hairs! My wife was sitting beside me when I exhaled my first cloudilcious puff and immediately she yelled pass it over! Smells great in the bottle, tastes great in your mouth and fills the room with puffy clouds of intoxicating goodness! We’re doing our best to try and make this juice a weekend treat juice, but we’re really finding it difficult not to fill our tanks over and over again. So do I like this juice? It depends. Are you thinking about buying it, then no I absolutely hate it and you should save your money. If an absolutely amazing coffee/hazelnut/cream blend in what seems like the most perfected mix I’ve ever tasted is not your thing, then I’ll say yes it was worth every penny I spent. Let’s keep this one our secret. This profile has been touted as one of the top juices on the planet and we can see why. It’s so smooth, so creamy, and oh so tasty! It’s a treat vape based on the price, but it could easily be an all day vape for those who don’t mind the price. It’s perfectly balanced as we have come to expect of the Flavour Master, Mr. Phillip Rocke. It wins for best Coffee at Vape Summits all the time, but it’s not really a coffee profile, it’s there for sure, but is more of a Hazelnut & Brandy Cream profile. It’s rich without being overpowering, sweet without being overbearing. It really is a masterpiece. 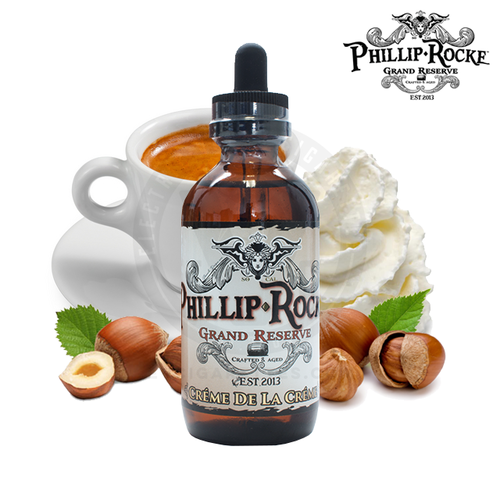 The Front is a wonderfully Creamy mix of Hazelnut, Dark Coffee and a note of Brandy. The back is all Creamy Sweet Hazelnut. The inhale (Front) is where it’s at, you almost don’t want to exhale, it’s one of those flavour mixes that just works so well as vapor. Treat yourself to a bottle this holiday, it’s the perfect profile for the holidays and goes wonderfully with a fresh glass of Eggnog. Best coffee flavored juice out there. I have tried many. This is an often replicated, never duplicated one. The flavors are perfectly blended for ultimate smoothness. Zero throat hit. Good vapor production. The coffee notes are very “real” tasting, like taking a whiff of a freshly cracked bag of coffee beans. Many others that I have are very synthetic, and promptly make their way to the trash. A++ if you are into coffee vapes, but have not yet found one up to par with your expectations. Just order it. You will not be disappointed. The hype is very real. Very strong flavor. The only thing I don’t like is the brandy taste to it. I don’t drink and hate liquor, so I don’t know what I was thinking picking this up lol. It is definitely an acquired taste IMO. I’m only on my 2nd tank of this so maybe I should have waited a bit longer before commenting. Anyway, first thoughts are very positive although I don’t get any of the coffee flavour whatsoever. What I do get is a very rich and creamy hazelnut/brandy combination, with zero throat hit (3 mg). It also produces good clouds, if you’re into that sort of thing. (I’m not). Overall, a nice premium juice that I will be re-ordering. This e liquid gets 4.9 stars only because I like the Honey Creme better. Everything with Phillip Rocke’s name on it, that Ive tried, is truly exquisite. Just received my 3 bottles, well over a year since I vaped creme de la creme, it’s always as it used to be, truly one if not the best juice I ever had in this 3 years journey without cigarettes. I have to say that it’s the only liquide that gives that sense of calm, zenitude when I vape it. Still amazing, still great, 60ml rocks!!! Thanks for the fast and great service! I just tried it yesterday, and definitely this juice will never leave my shelf, the coffee hazelnut taste is unbelievable.